Guest blog post by a co-author ofThe Box Under The Bed,Barbara Anne Helberg. “Free critique”, “writing contest”, and soon after, “scary anthology” were key phrases that captured my writer’s heart during July/August, 2017, on WordPress. A WordPress blogger and Internet writer of over a thousand articles since 2007, I didn’t have a definite, or specific, commercial publishing goal in mind recently until those six words came in sight during a routine WordPress browsing session that led me toDanand new possibilities. Today, I have an Author Page at Amazon:Barbara Anne Helberg. I entered Dan’s July writing contest and found someone who enjoys spreading his writing wings to the mutual benefit of other writers. And I found someone who has fun leading even unpublished writers to bona fide authorship through self-publishing. We have a legitimate #1 BESTSELLER on our hands. Or in our hands, as the case were. ABOVE, some of The Box Under The Bed co-authors, L-R: Allison Maruska, J. A. Allen, and Dan Alatorre, signing copies of TBUTB for fans at the Florida Writers Conference. These are SALES, not free downloads. GREAT JOB to EVERYONE who wrote a story for this! You are now all bestselling authors. There are literally MILLIONS of books sold on amazon; ours is in the top 5000. That is BIG! #1 in Books > Literature & Fiction > Genre Fiction > Horror > Anthologies. I am a Ricardian. I am proud to be one of Richard III’s loyal advocates, trying to clear his name from the calumny with which Henry Tudor tainted him. I wanted to DO something, something special, and so I decided to write a novel about him. A different type of novel, set in the twenty first century, with a Richard who comes forward in time to learn of his fate at Bosworth, research it and try to go back to change it. Bosworth – it always comes back to what happened that day! If only Richard had got to Henry! If only he hadn’t charged! If only he had taken a horse and fled, to fight again another day! How different our history might have been with Good King Richard on the throne. Sigh! Guest blog post by a co-author ofThe Box Under The Bed,Christine Valentor. 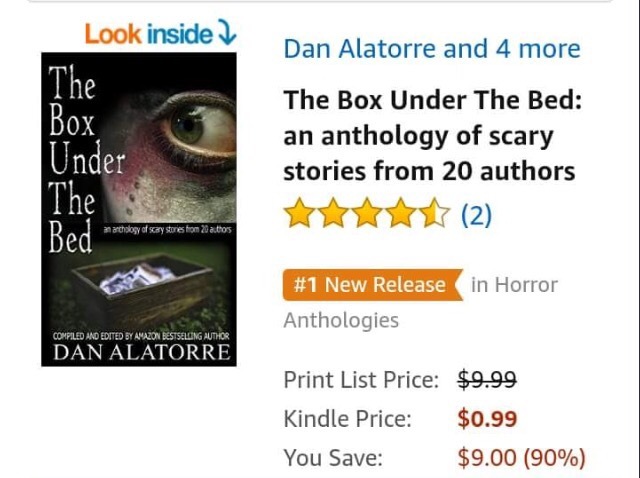 Our anthology,The Box Under the Bed, was released on Amazon this week, and I could not be more thrilled! I am proud to be a contributing author to this book. Although I have had stories published before in literary journals, this was my first time to be published in a commercial work, one that is actually available on Amazon. The experience has been exciting and unique! I knew I wanted to be a part of it.